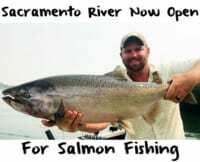 Air temperature in Southern Oregon and the Upper Sacramento Valley is controlling the number of salmon that enter the Klamath River right now. We’ve been catching some salmon and steelhead for a few weeks, but I’m betting that the next few cool nights those areas get we’ll see a large push of fish come through Klamath Glen. Unfortunately, when air temperatures warm inland water temperatures rise on the Klamath keeping salmon in the ocean longer. However, when temperatures cool in the Sacramento Valley and up in Medford and Klamath Falls the Klamath River cools and salmon dart into the system. While those areas are not necessarily in our backyard the Medford/Klamath Falls section contributes to our water temperature on the Klamath side and the Redding area underwrites the Trinity side. The key is cooler night. When those areas cool at night, the water cools and the salmon respond by coming in. In early and mid August our salmon go on and off the bite with water temperature. Temperature dictates how many salmon come in with each tide. When the temperature rises we are seeing less fish come in. When they enter the Klamath Estuary and feel the warm water they turn out and go back out in the ocean. 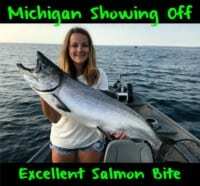 Even if temperatures don’t fall we’ll see more salmon soon. Two things, meanwhile, can occur to draw fish in: cooler water and increased flows. Luckily, we are expecting rising water on August 15. I’m hearing roughly 300-400 cfs of more water will be released on the Klamath, which apparently is set to last one month. The increased flow will bring some fish in because they are going to feel that fresh water entering the ocean. Another thing that can aid us is fog and clouds. We had a little system come through for a few days two weeks ago, which cooled the system and brought in fish. While our season won’t peak until September we’ll see daily increases of salmon. 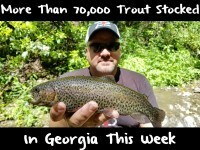 A nice spurt of steelhead already arrived and we’ll see more, too. Most of the adult fish we are catching are at least three year olds. Our average fish up here is normally 12 pounds, but we are seeing some four year olds, too. Last week the salmon averaged 15-18 pounds. There’s been a lot of talk about moss affecting the fishery. The moss was really bad about three weeks ago, but it’s cleared up. We’ll see more moss when they increase flows on August 15, but it will clear up in a few days. Techniques have been standard. I’m side-drifting and boondoggling red Fire Cure roe and a Fish Pill. Actually, I’ve been mixing red BorX O Fire with red FireCure to create firmer eggs, especially in this warm water. The warm water tends to drain that egg out. When I add the BorX O Fire the eggs stay red longer, egg hold up better and milk out more efficiently. Special regulations: The Klamath River is open to spring-run Chinook salmon fishing from Jan. 1 through Aug. 14 with a daily bag and possession limit of two salmon. From Aug. 15 through Dec. 31 a daily bag limit of four Chinook salmon, no more than three adult Chinook salmon 22 inches or greater when the take of adult Chinook is allowed and a possession limit of twelve Chinook salmon, no more than nine adults 22 inches or greater when the take of adults is allowed. Editor’s Note: Pautzke pro Alan Borges operates Alan’s Guide Service. To learn more about his trips please visit alansguideservice.com or call 707-496-9074.